← The case for Zelda on NX. Party Hard is a curious title in a number of ways; it’s curious in that its developer, Pinokl Games, who had previously only worked on family-friendly mobile titles, have decided to create a game about cold-blooded massacre. It’s even more curious that they have somehow managed to create a game about cold-blooded massacre that is charming, funny, and really damn fun. 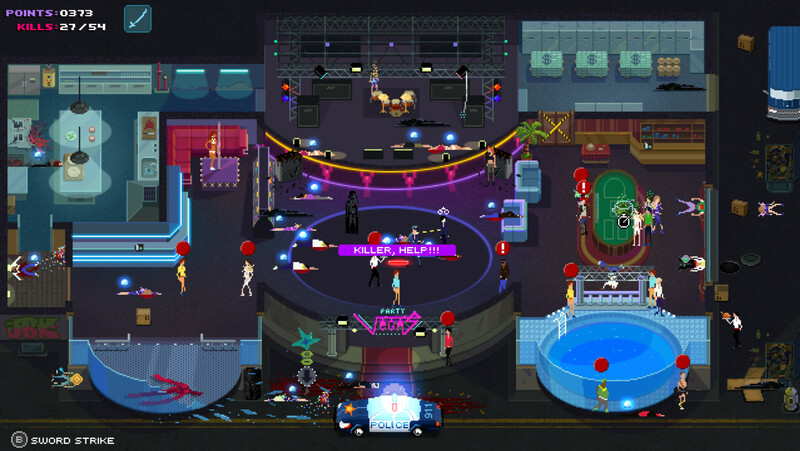 Party Hard started off life as a Game Jam title in 2014, putting you in the shoes of the ‘Party Hard killer’. It’s 3am, and the party next door is just too loud. Coming to terms with the fact that they’re probably not going to turn the music down if you ask politely, you don your trusty hockey mask and knife, setting off to quiet down the neighbours. Permanently. 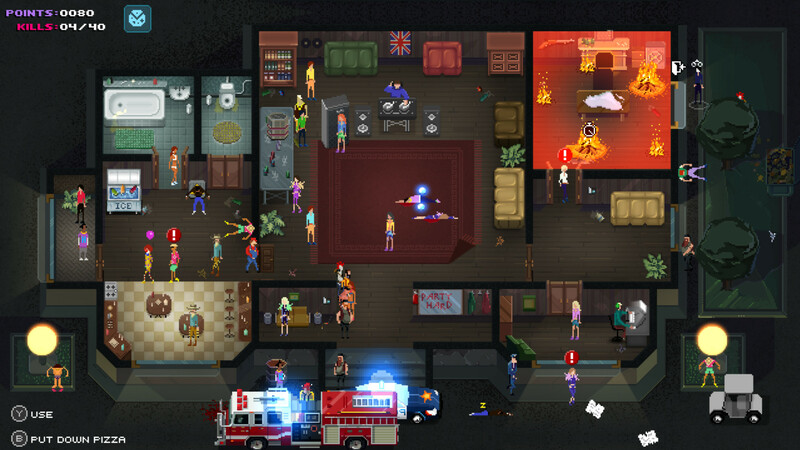 However, with the help of indie publisher tinyBuild, Pinokl have evolved the simple yet satisfying concept of this strategy-action-murder game into a full-blown party crashing experience. Now, as opposed to solely playing the role of killer, you now follow the enthralling tale of detective John West, a man who has just one thing on his mind; put these senseless killings to a stop. The story is told in a retrospective manner, through discussions and flashbacks, and the introduction of a plot to follow not only gives some direction to the original concept behind the game, but really showcases how much the game has evolved from a Game Jam game into a full title. Dialogue in-between titles is fully voiced, and a combination of some top-notch writing and the developers’ impeccable selection of voice actors help set the raw tone of the game’s humour right off the bat; even as early on as the opening cutscene, it’s difficult not to chuckle despite the supposed seriousness of the subject matter, which does a good job at ensuring the game doesn’t simply fall flat due to the questionable morals of its protagonist. Taking into account the seemingly simple concept, you might be reading this and thinking ‘well hold on a minute, killing people at a party can’t be that hard, right?’ (and I’m certainly hoping you aren’t saying this from experience! ), but you will quickly realise that the experience that Pinokl have crafted here is not merely about instigating carnage with brute force; it’s about the apparently artful, strategic act of killing an entire party’s worth of people. If you want to complete your criminally insane goal, you’ll have to be smart, thinking tactically about who to go for first, and how you’ll go about disposing of them. A number of different gameplay elements factor into this and your limited but effective options for carrying out your killings must be used wisely if you wish to maintain perfect stealth. Your primary moveset is simple and easy to grasp; you’ll find yourself relying on the trio of stabbing, picking up (usually dead) bodies and dancing. The first two are important for the perfect kill; if you’re going for straight up murders with the knife as opposed to using the environment around you, you’re going to have to make sure that you don’t get seen; if you’re seen doing the dirty deed, or even suspiciously hanging around the scene of a crime, the partygoers will call the cops faster than you’ll get told to “F**k off!” by fellow guests if you try and bust out your Saturday Night Fever-style moves on the dance floor. Of course, if you don’t want to be treated with suspicion, you have to blend in; sometimes this can be simple as carefully planning your escape route, taking into account environmental factors such as windows you can slip out of to make sure you don’t get caught red handed, whilst on other occasions the best course of action is to use the all-important dance button; it’s not just there to look funky, but to help you seem like an ordinary party-goer as opposed to a homicidal maniac. Escape routes aren’t the only way you will need to use the environment around you; it must be taken into consideration if you plan on committing the perfect crime, and luckily the game has plenty to offer in this aspect. As you progress through the game, each stage sees you in a different party at a different location. Each has its own unique theme and visual style ranging from your regular old suburban house party filled with intoxicated college students to a western-styled ranch filled with bikers, complete with shotguns on the walls and cattle in the fields. This constant change of scenery helps keep every murder spree a fresh, individual experience. Along with bringing new places to kill, each stage offers you different ways of going about said killing; environmental hazards can range from simple, recurring ideas such as food suitable for poisoning, or carelessly placed petrol cans ideal for starting a fire, (something that can also serve as a distraction as opposed to just a weapon), to area-based tools that at times can serve as one of the game’s comedy elements; why use a knife when you can anger a bull and send it charging through crowds of dancers? The game gives you a lot of freedom in how you plan to go about your crime, and in combination with semi-procedurally generated environments that change every time you play a level, you can be sure that no two massacres will be the same. An ever-changing playing field filled with creative killing methods isn’t the only way the game serves up its replayability; the need for stealth and smart thinking to avoid being caught naturally brings about a challenging experience that requires a new approach every time. Even when you think you’re in the clear, something as measly as an undisposed body or a partygoer passing by a window could be your undoing, and items such as a fresh change of clothes can be an absolute lifesaver when it comes to avoiding the police. It’s not just the locations where you’ll be killing that change up though; the people you’re aiming to send for an eternal sleep are just as unpredictable. Simple NPC behaviour, such as the couple making out on the balcony, the guy sitting at the computer in the dark even though he’s supposed to be at a party or the party-goer who’s had just a little too much kneeling over the toilet not only help bring together a detailed and somewhat realistic experience, but are a major factor in selecting your targets that require a keen awareness of your surroundings and the people in them. As well as the numerous pre-set (yet randomly selected) patterns that party attendee’s follow, several random occurrences that can aid or hinder you not only bring hints of comedy to your mass slaughter, but warrant the need for a ‘somewhat’ prefix to describing the game’s ‘realism’; there’s something both funny and satisfying about a pack of bears suddenly crashing the party, doing the dirty work for you, and taking the time to enjoy the thumping disco beats for themselves; it’s something that really has to be experienced first hand! On the topic of disco beats, the game’s soundtrack fits very well with the party theme, with disco-styled music providing a catchy backing track to your crimes, and at times even being strangely and pleasantly reminiscent of the SEGA arcade soundtracks of old seen in games such as Streets of Rage or OutRun. 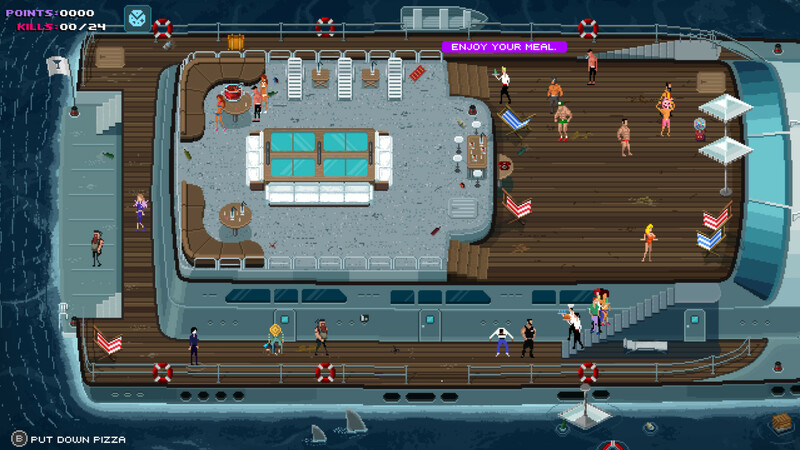 The game’s gorgeous graphics truly complete the experience; each party-goer looks unique and is oozing with personality, even in pixellated form. Animations are smooth and environments are highly detailed, showing off some well-executed sprite work. The top-down view of the game, design of the environments and pixellated, cartoony violence work very well together, and at times I even found myself thinking of LucasArts SNES/Mega Drive classic Zombies Ate My Neighbours. It’s a pleasant return to a style of game that is unfortunately not as common these days. Despite the retro throwbacks (including an appearance from a curiously familiar plumber who is more than happy to beat you senseless himself if he sees you up to no good), this complete version of Party Hard brings about some truly modern innovations; the introduction of special Twitch functionality, enabling streamers to have their viewers interact with the game through Twitch’s chat functionality, will no doubt prove popular on launch. It serves to make the game more unpredictable (and in turn, fun) by allowing audience participation in triggering random events (such as the bears mentioned earlier), offering a hilarious yet not too overbearing method of encouraging people to enjoy watching the game as much as playing it; yet another example of how Pinokl have evolved and expanded the original Party Hard concept into something new and fulfilling. 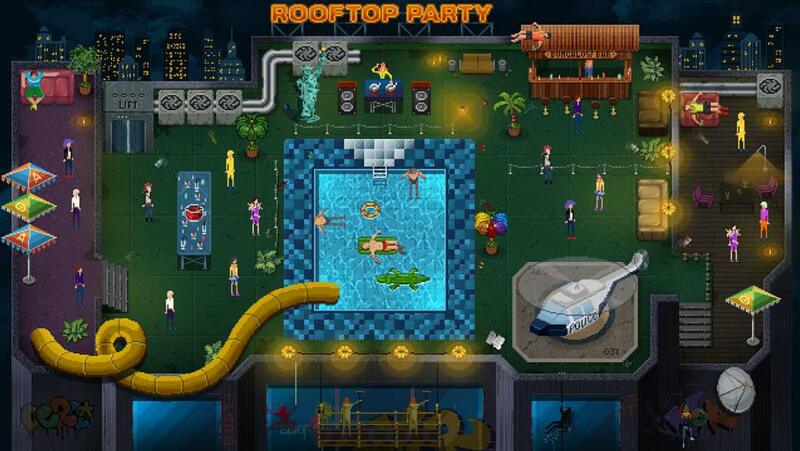 If you’re looking for something original, fun and with plenty of replayability, Party Hard is for you; it has simple yet satisfying gameplay based around a well-executed concept, and carries with it an arcade-like feel that makes you want to come back again and again to see how your experience will differ. It offers longevity through multiple creative and original stages, smart use of procedural design and through a plethora of options that ensure you truly receive a fresh experience on every playthrough, and its appealing and attractive visual style ties the whole experience together. Whilst I’m not sure I’d want to attend any of the parties featured in real life, I can safely say that Party Hard is one party you definitely want to be invited to. This entry was posted in Reviews and tagged Indie, Indie Games, PC, Reviews, tinyBuild. Bookmark the permalink. Looks pretty cool. I’ll need to check this out. We are actually in the process of developing our own Indie Game! Sounds like it might be fun, although I’m curious as to whether you think this game is really worth purchasing considering it’s price is £9.99 Or if it’s more of a £5 value sort of affair. It’s difficult to say, really. In terms of the amount of content, I’d say you’re getting your value for money. There are a dozen stages, each very unique and detailed in design, but it’s the progressive difficulty and the actual challenge of completing each stage that primarily adds to the game’s physical length. Whilst each stage comes with its own unique elements, there are more generic, repeated elements throughout the levels (starting fires, poisoning food etc) which, along with some of the NPC’s behaviour, can lends itself to making the experience feel a tad repetitive over time. It’s a game that’s best tackled in short bursts, to savour the humour and uniqueness of each level, and this is what likely makes it the kind of game that will be popular with streamers. There are definitely games out there that give you less for your money, and by the looks of it Pinokl will be supporting it post-launch with free content updates, so it’s one to watch if you’re not completely sold on the idea now.